This page is about Hive13 history. I remember hearing about hackerspaces from a few places online, but the article in Wired really crystallized it for me, like I think it did for a lot of people around the country. I wrote this blog post and went out to try and find other people into the idea locally. I found Chris Anderson via his dorkbot-cinci page and met up with him at a Cinci2600 meeting at The Brewhouse. He said he was aware of a few others from 2600 and some other people too and I suggested we create a mailing list and meet up sometime. I think that's when we created the Google Group. I remember Jason Bailey joining the Google Group and bring in a ton of people from ArsClan. Through the mailing list I think we scheduled our first meeting at Panera. We met once at Panera in Clifton. It was the first time many of us had met face to face. It was April 25, 2009. There were about 11 people. We talked about how the group should be organized. Should we incorporate? How will we get money for rent? We talked about what kind of equipment we wanted to have. WE also broke down into the "working groups" that worked on specific tasks: Paper Pushers, Meatspacers, Tool and Skillmongers, Scroungers and Scavengers, Propagandists, and Communications. We decided to meet again in two weeks to see if anything had been accompmlished. Our second meeting was on May 9, 2009 at Taza in Clifton. Again there were 11 people, but some were new faces. Chris Anderson had given a recent talk and we had listed ourselves on hackerspaces.org so we were already attracting people. We talked more about how the organization should be formed, what type of non-profit, what kind of board, etc. We met as a group again at Taza on May 23, 2009, June 2, 2009, June 9, 2009, June 16, 2009, and June 23, 2009. On June 11, 2009 Chris, Craig, Dave, and Jason met at Taza to finialize and sign Ohio Form 532 which incorporated Sad Bee, Inc. Sad Bee, Inc. is the name of the non-profit corporation that is Hive13. We filed a "DBA" form which means "doing business as" to give ourselves the additional name of "Hive13". As far as I can remember, either Craig, Chris, or Jason was playing with the letters of our names on June 11, 2009 when we were filling out the incorporation paperwork and had written down "SADB" ( which was Smith, Anderson, Dave, Bailey (purely accidental that it was my first name instead of my last name ( we could have been Sam Bee, Inc.))). SADB became "Sad Bee". There's nothing deeper too it than that. We filled out the DBA form almost immediately which makes Hive13 a legal name so Sad Bee is almost never used. It does appear in our Bylaws and a few other places. It's the name you'll find if you look us up with the Secretary of State. On June 21, 2009, Craig and Dave visited the space at 2929 Spring Grove and signed the lease with Grant. Dave took this video of the completely empty space. Rent was $1150 per month and we had 12 people willing to pay $100 per month to get us started. Our first meeting in the space was June 30, 2009. At our first meeting we talked more about how to structure the organization, getting some basic equipment in, including kitchen appliances, and planning for our Grand Opening party / open house. 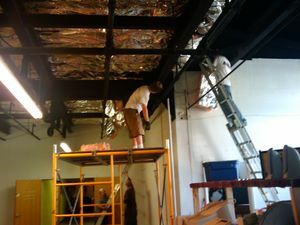 One of the first things we did ( which was a condition of our lease) was to help Grant with sound-proofing and insulating the apartment directly above our space. We shared the cost of the insulating material and helped Grant install it. $360 - Spindle replacement for the BFR 9000. $450 - Electrical upgrades for new studio. Coy - rewired the BFR 9000 to address some cable routing problems. Jon, Ryan - rewired the Shapeoko, got a start on some control software. Bill, Ryan - Replaced the gigabot control board with Arduino/RAMPS. Enabled automatic bed leveling. Lorin - Coordinating summer youth programs with Hamilton and Boone County Libraries. Lorin - Biweekly make-a-thon: 3d Print-a-thon! This page was last edited on 3 June 2018, at 22:46.